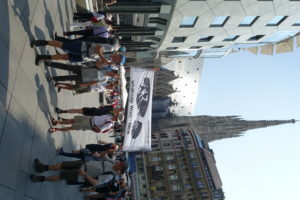 Vienna, Saturday 3 June, Stock-im-Eisen place close to the Stephansdom, 25 years after the start of TransALPedes at the same location. Greetings of Andreas Schieder, chair of SPÖ in the Austrian parliament and of Naturefriends Austria and Peter Hasslacher, chair of CIPRA Austria. 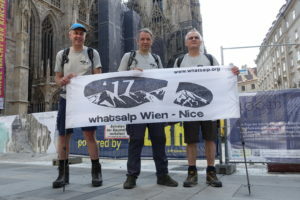 The members of the whatsalp core team drive three nails into a wooden beam. This as a symbol for a sustainable and climate-friendly future of the Alpine regions. The trombone choir “Ökumenobrass” accompany the event with dignified strains. Our first destination is the ecohotel Stadthalle near Westbahnhof, a model project of the Austrian ecolabel. 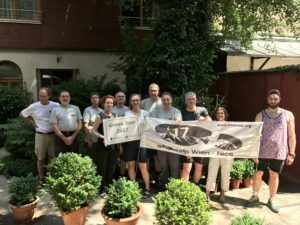 Regina Preslmair from the ministry of environenment and Cornelia Kühhas from Naturefriends International are organizing a green tour along their member hotels, about 200 all over Austria. On the Perchtoldsdorfer Heide Irene Drozdowski und Alexander Mrkvicka from „Freunde der Perchtoldsdorfer Heide“, biofarmer Erich Frank und Norbert Weixlbaumer from the University of Vienna von der Uni Wien welcome us. 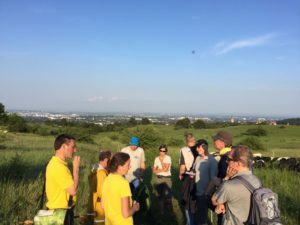 Together with them we visit the “Perchtoldsdorfer Heide”, one of the most important protected areas in the easter Wienerwald. Dry grasslands like here are of an unpayable value for the future of biodiversity.